Couldn’t resist including her speech here because it truly touched my mind. I was restless until I ran into the store to check out the collection. I can’t recall when was the last time I got this excited for a makeup launch. To be honest, the excitement wasn’t about a celebrity endorsement (although I’m a fan of Rihanna since her song – Unfaithful) but the unique product range. The first thing I want to tell you, Fenty Foundation changes color once it is dry (or I should say – oxidizes). This fact reminds me of Too Faced Born This Way Foundation. I appreciate that this getting-deep thing is clearly mentioned in Fenty website. The brand instructed to decide the shade match once your swatch is dry. I wanted to try the Fenty Foundation with its primer to understand the best use of it. Pro Filt’r Instant Retouch Primer is a water based primer, has Glycerin, Talc and Sodium Hyaluronate in it. I’m glad that it’s not a silicone based primer, I not a fan of silicone. But initially, I was skeptical seeing Talc in the ingredient list! The primer is lightweight and goes on very smoothly on the skin. It gives the skin a soft veil, without the shine but with a dewy sheen which I love. It keeps my skin really hydrated throughout the day. Earlier, I’ve been using Laura Mercier Radiance Primer all over and Benefit Porefessional to cover up pores. With this one, I went without Benefit Porefessional. Eventually, I fell in love with the finish it gives alone. The Pro Filt’r foundation, obviously, works with it very well as well as my other foundation; e.g. MUFE Ultra HD and Estee Lauder Double Wear. When we talk about Fenty Beauty, the range of foundation definitely gets the highlight. I truly appreciate the forty shades of foundation, from the lightest to the darkest, with a proper variation of undertones. Needless to say, I was super pumped to find my shade from Fenty Foundation. I have a very critical skin tone. Yes, I’m a tawny, with a serious warm hue and the most critical fact is – I’ve olive undertone. It has always been a struggle for me to find a perfect match for my skin. I matched myself with the shade Neutral Olive – 360. When I swatch foundation I usually match it with my hand because my hand is more tan(due to the lack of using sunscreen) than my face. Thus I prefer using a slightly deeper shade of foundation on my face so that my face and hands look similar. It was confusing at the beginning to pick between the shade 350 and 360. The shade 350 doesn’t have olive under tone. Where the shade 360 was getting slightly deeper (the blended part of the picture above). I ended up getting the 360 considering I’ll be using a primer, contouring stuff, setting spray and else which will eventually balance out the shade. Fortunately, when I tried the foundation it turned out ok. The best part about the Pro Filt’r Foundation – It is extremely lightweight, buildable to full-coverage with just a second layer. The first day I wore the foundation (with the primer and UD All Nighter) for solid 8 hours. It looked great at the end, except it did crack on my smile lines. The day was rough though, I was traveling and there were a lot of activities. 2nd time I wore the foundation for 5 hours and it was a normal comfortable day. The foundation performed well without any cracks, fuss or anything else. I found out Fenty foundation applies the best with my Beauty Blender. Match Stix – Matte comes with a variety of 20 shades. They’re meant to serve the purpose of concealing and contouring. They also come in a trio package ( That includes one or two shimmer stix) with a fraction of the price to cater individual preference. I not really a fan of cream contouring so I got a single one to use it as a concealer. The shade Latte Matched my skin the best. It has a warm-olive tone as well. Initially, they look super matte but their bendability is incredible. I’m amazed seeing the coverage of this concealer as well. Have a look at the swatch picture above, the concealer covered my veins completely. The concealer has a tendency to get deeper as well just like the Pro Filt’r Foundation but not quite as much as the foundation. It stays put without cracking or so. I fell in love from my first use. For a daily basis, I’m just wearing it alone, covering up whatever little imperfections I’ve and then I’m good to go. I’m happy that I picked the exact match rather considering a contouring shade. Everyday makeup became way easier now. Killawatt Freestyle Highlighter comes with 6 variety. Four of them are in a duo form, one subtle shade, and one intense shade. Other two is solo, Metal Moon & Trophy Wife, an insanely supercharged version of highlighter. I had my eyes on the Trophy Wife ever since I noticed the promo picture of it. When I swatched it at the store, I was like, ‘man! this has never been in the world before!’ Girl, I swear my pictures doesn’t do any justice with the spark of it. This is simply your party highlighter. Killawatt Trophy Wife is has a creamy-powder texture and it applies like a dream. The super fine shimmery highlight powder is also loaded with some ultra-charged sparking particle. This is the most unique one among all 6 Killawatt. Frankly, if you are not a makeup fanatic Trophy Wife can be challenging as an everyday highlighter. However, If you want to lit like the sun then this is just a must have. The picture below I’m wearing all Fenty Face. The Pro Filtr Instant Retouch Primer and Soft Matte Foundation in shade 360 for the base. Match Stix in shade Latte to cover up dark spots and also under my eyes. The Killawatt Trophy Wife is everywhere, from the corner of the eyelid to brow bone to cheek bone to my collar bone. How do you like the look? Does that glow of Killawatt catch your eye? Overall, I love every product I got from Fenty Beauty. Packaging-wise I would say it’s pretty, everything is decent, nothing to complain at all. However, if I think of Rihanna then the packaging feels quite off. Only the Killawatt Highlighter, Trophy Wife, feels – Yass, this is so Rihanna like! I’m not a lip gloss user at all, I really wish there was some lipstick. Although I understand the ‘mix-and-match-use-less’ thing you can do with the Shimmer Stix. Yet for me, a lipstick is always a lipstick! Perhaps Fenty Beauty will come up with new ranges in future. After all, this is just the beginning! 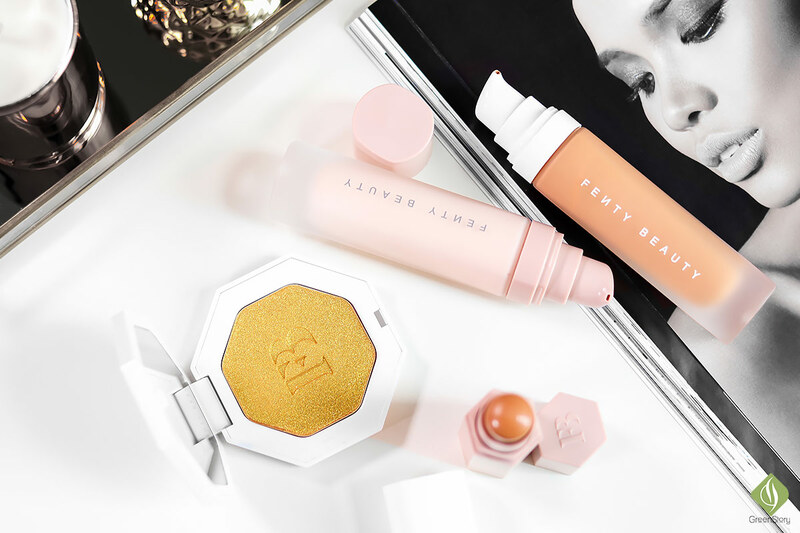 Fenty Beauty is available at all Sephora store and online. Also, you can get them directly from Fenty Beauty website. Hi Tamanna. Great review! Since you use Estee Lauder Toasty Toffee, how would you say the shade Fenty 360 compares to Toasty Toffee? Is the 360 as warm/neutral olive as the 4W2? Or would you say the Fenty pulls more pink? yes the shade 360 has the exact olive tone like EL double wear 4w2. Thats why I got it. Otherwise the fenty shade 330 was close to my match but that one didn’t have a olive tone like I wanted. Fenty shade 340 and 350 pull out pink tone. Wow the packaging is beautiful and you look stunning in this makeup. Definitely going to get my hands on Fanty beauty. Sigma Dimensional Face Makeup Brushes | 4DHD Kabuki Makeup Brush - just gimmicky or an invention?